Utagawa Kuniyoshi (1797-1861) is considered one of the greatest Japanese print artists. 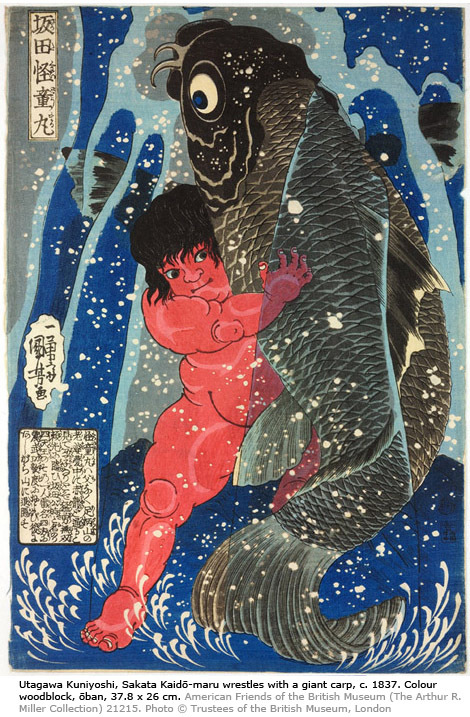 Prolific and multi-talented, Kuniyoshi portrayed the historic heroes of Japan’s warrior past and through masterful storytelling kept alive the great myths and legends. His depictions of fashionable beauties and actors reveals another strand in his work, as do his prints of comical or satirical subjects, vivid reflections of his lively sense of humour. The exhibition will display Kuniyoshi’s most staggering imagery, from his innovative representations of tattooed Chinese heroes of the Suikoden, to his most successful applications of Western perspective, as well as good examples of his humorous designs. JapanCentre.com is also offering the chance for one lucky customer to win a pair of tickets to the exhibition on a day of your choice! All you have to do is enter ‘Kuniyoshi Competition’ in the comments section when ordering online and you will be automatically placed into our Prize Draw! Good luck! Competition now closed. Well done to our winner Simon Gill from Worcestershire!